14k gold Braid of Three wedding band. This captivating wedding band measures 8mm wide and is a substantial band. Such a beautiful hand braided design features a rope center. Our price shown is for the size 5 weighing 7- 7.5grams. This wedding band is made to order and available in 14k yellow or white gold, 18k yellow or white gold, or Platinum. Use our special request for custom pricing. Gram weights are listed next to your selected ring size. Pretty tri color braided wedding band. This wonderful ring measures 7mm in width and weighs aprox. 9.5grams for the size 7. This ring is part of our custom made to order collection and is available in 14k yellow, rose, white or a combination, 18k yellow, rose, white, combination, and also Platinum 950. Custom width also available. Any size also available, custom made items are non returnable but allows us to give, our customers the perfect ring. It's simple, your buying the ring, you decide how it should look, just drop us an email for pricing. Tri color braided wedding band. Beautiful tri color gold rope design is braided and channel set with border on either side. This wedding band measures 7mm wide. This ring is part of our custom made to order collection and is available in 14k yellow, rose, white or a combination, 18k yellow, rose, white, combination, and also Platinum 950. Custom width also available. 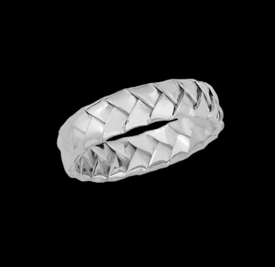 Any size also available, custom made items are non returnable but allows us to give, our customers the perfect ring. It's simple, your buying the ring, you decide how it should look, just drop us an email for pricing. 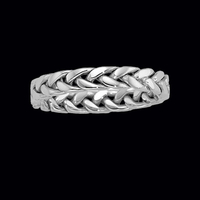 14K Yellow or White Gold hand Braided Wedding Band. This Lovely Band measures 3.75mm wide and is available in a large variety of whole sizes. 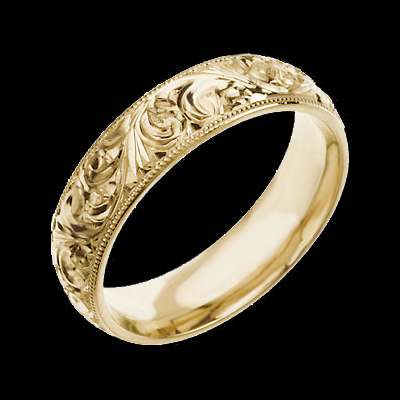 Wedding band design is a true woven gold band is a timeless style often emulated but rarely seen in this most classic form, an intriguing expression. Special Order this in Platinum - email for pricing. Incredible leaf design wedding band. Shown in 14k White gold base set with lovely 14k Yellow gold leaves forming a circle set in a white gold channel. This wedding band measures 7mm in width. This ring is part of our custom made to order collection and is available in 14k yellow, rose, white or a combination, 18k yellow, rose, white, combination, and also Platinum 950. Custom width also available. Any size also available, custom made items are non returnable but allows us to give, ourcustomers the perfect ring. It's simple, your buying the ring, you decide how it should look, just drop us an email for pricing. 14K White Gold Hand Weaved Wedding band. 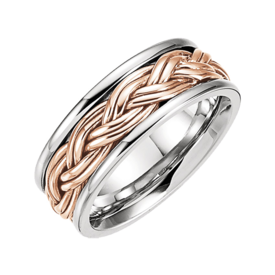 This stunning hand woven wedding band measures 6mm in width Also available in Yellow Gold (Rose gold by special request) or Platinum (by special order). 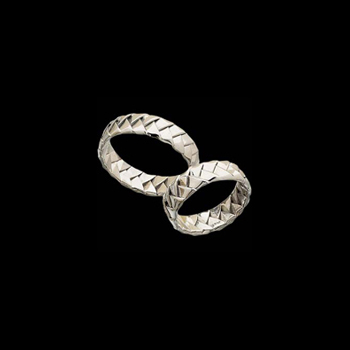 A beautiful hand created symbol of your love and devotion that will last for a lifetime. Beautiful 14k Yellow or White gold etruscan Inspired wedding band. Feminine heart pattern is sure to be a favorite. Wedding band measures 8.25mm in width. Stock size: 7. This amazing ring weighs 11.76 grams for the stock size 7. Additional sizes add 4-5 business days before shipping. 14K Gold Braided Wedding Band. Hand crafted woven design is cradled within a comfort fit band. This ring design is a timeless classic, a fantastic expression of your love and commitment. 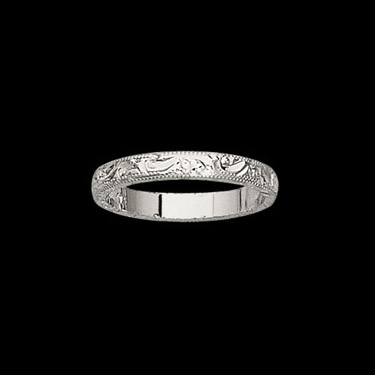 Engraved Wedding band. 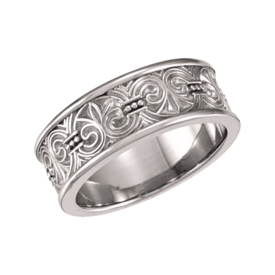 Similar to the Milgrain border wedding band, this wedding band has a milgrain edge and is a hand engraved comfort fit wedding band. Measures 6mm wide. This beautiful scroll design is an elegant symbol of your devotion and love. 14k Yellow Gold, this lovely style is available in whole sizes from 5-12. Free Engraving~Add Sentiment to comment box during checkout. Some sizes require 8-10 weeks before shipping so order early if this is your ring. 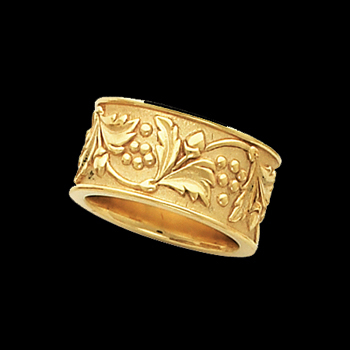 14k Yellow Gold Floral design ladies band. Gorgeous design, just one of many new exciting designs. Our price shown is for the size 5. Band measures 8.25mm wide and weighs 9.7 grams for the size 5. Special order in 14k White gold. 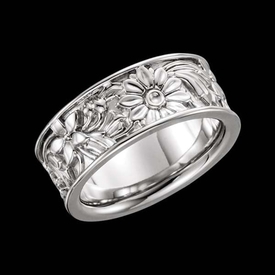 14K Yellow or White Gold Hand Carved Wedding band. Now available in Platinum. Create that special memory with a special Carved design ring. This ring measures 3mm Wide. 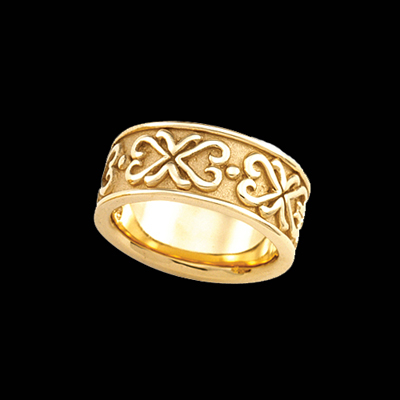 14k White or Yellow gold Fleur-de-lis inspired design wedding band features a continuous pattern of the c-scroll, bead trim, and fleur-de-lis designs. Lovely design wedding band measures 7.5mm in width and is a nice weight, example size 7 weighs 8.14grams. Free engraving on this lovely wedding band.